No Ghanaian journalist, worth his or her salt, should ever fall for the Machiavellian plot to destroy the reputations of Kweku Baako Jnr, and his brilliant protégé, Anas Amereyaw. That shabby plot, is one of the most disgraceful conspiracies, ever to be hatched by members of a serving government, in Ghana's entire history, since independence in 1957. Pity. That vile and cynical plot, according to bush-telegraph sources, was apparently hatched by a greedy cabal of cynical regime-insiders, whose secret agenda, is apparently to exploit their positions in the administration of the serious-minded and honest President Akufo-Addo, for personal gain - at Ghanaian society's expense. Hmmmm, Oman Ghana, eyeasem o - asem kesie ebeba debi ankasa. Furthermore, it is vial that all independent-minded, and fair-minded Ghanaian media professionals, understand clearly that the loaded-phrase, often bandied about by the cynics in President Akufo-Addo's regime: "We must watch the raw unedited video footage of The Tiger Eye Private Investigators' story..." is actually code for: Let us see if we can find something in the unedited video recording, to enable us trip up that confounded nosey-parker, who wants to ruin our wealth acquisition plans. Any politician in our homeland Ghana, who frequently utters that abominable and unpardonable phrase, in connection with the work of the Tiger Eye Private Investigators, is definitely an individual who must monitored closely, by the Ghanaian media, at all material times. 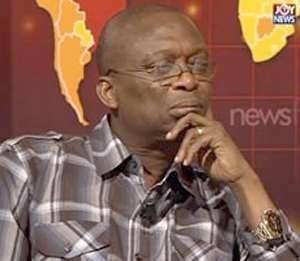 The question we must all ponder over is: Has Kweku Baako Jnr not spent virtually all his adult life fighting corrupt and dictatorial military regimes that tried to enslave the good people of Ghana in the past? And has Anas Amereyaw not also worked hard most of his adult life to expose egregious corruption in Ghanaian society? They are national heroes, not villians, to be freely condemned by feckless politicians. Who born dog? Haaba.